This is a 3-gallon (11-L) all-grain recipe for my copper ale. This beer was formulated without reference to an existing beer style, and was meant to simply be an “everyday” beer. (If you need to attach a style too it, I guess you can call it an alt.) The beer is malty, I balanced with a solid hop bitterness. I have previously posted the 5-gallon (19 L) version of this recipe. 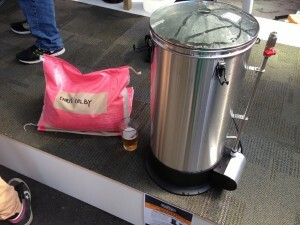 Other 3-gallon (11-L) all-grain recipes I have posted include a porter, pale ale, dry stout and an amber ale. This can be brewed with a simple 3-gallon (11-L) all-grain brewery. 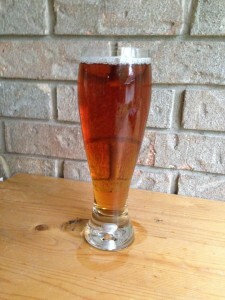 A copper-colored ale with a nice, “Fuggly” hop aroma and malty flavor. Designed as an “everyday” beer. It looks like this, although this isn’t it. This is the recipe for my copper ale. The name is simply a reference to the the color of the beer. I designed this beer to be an “everyday” beer that I would enjoy, and other people who have tried it have really liked it. I’ve brewed it eight or nine times now, and everytime I’ve mucked with the recipe a little bit. But, it’s always hovered around the same basic idea. I started with a blank canvas, so to speak. I didn’t start with an existing beer style and tweak the beer from there. Instead, I just thought of one combination of ingredients that I believed would go well together and started brewing. The grain bill started with pale malt blended with Munich malt, for a solid, malty base. A little bit of aromatic malt and Victory malt round out the malt character. (In previous versions of this recipe, Victory malt was the only (non-color) specialty malt, but I like the addition of aromatic malt.) I didn’t add any crystal malt — mostly because I wanted the beer to finish fairly dry, but secondarily because so many homebrew recipes contain crystal malt that I wanted to try something different. The color is tweaked by adding a small amount of roasted malts, chocolate and black malt. These add color, but there isn’t any roast flavor in the beer to speak of. I started thinking about the beer without any reference to existing beer styles, so it’s not surprising that it doesn’t really mimic any classic beer style. It fits the numbers of an altbier (BJCP category 7A) fairly well, but doesn’t really taste like an alt. Overall, it’s just a great “everyday” beer — balanced and drinkable, but with enough flavor to be still be interesting.